The NuWave Oven is a revolutionary new way to cook. It is different from other cookware because it uses safe infrared technology to cook food faster and thoroughly without generating the high heat that triggers an unhealthy result. 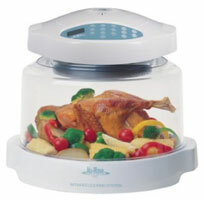 The Nu-Wave Oven requires no fats or oils for cooking poultry, meats, pork, or other meats. It a ultimate all-purpose oven for anyone that wants to prepare healthy and delicious meals. With its unique three-way cooking technology, the NuWave Oven can cooks up to 50 percent faster compared to your conventional ovens. It saves additional time because it does not require preheating like other ovens need. There is also no need for defrosting meat with the NuWave Oven. You simply place the frozen meat inside the oven and this unique system starts cooking the frozen food immediately. The Nu-Wave Oven can also save you up to 70 percent of the energy used by conventional ovens. Because the NuWave Oven utilizes its special Triple Combo Cooking power, you never have to preheat or defrost again. It also does not heat up the air around it while cooking. So it won’t make you kitchen hot like traditional ovens would. The NuWave Oven includes: 1”/4″ Cooking Rack, Liner Pan, Base Tray, Dome Holder, Dome, Power Head, 50 Page Recipe Book, Quick and Easy Cooking Chart, and an Owner’s Manual. Right now you can purchase the NuWave Oven for 3 easy payments of $39.95 plus the cost of shipping and handling for the white model or 3 easy payments of $44.99 plus shipping and handling for the black model. Order now and you’ll receive a set of bonus gifts that includes 2 Twister Blenders, a Pizza Flipper, 25 Gourmet Recipe Card Set, an Instructional DVD and free upgrade to express shipping. 2 Comments on "NuWave Oven"